Vilnius, Riga, Tallinn, and more! Explore lesser known countries in the Baltics - Lithuania, Latvia & Estonia. A land of wood and water, proud, Lithuania is fast being recognised as one of Europe's gems. Southernmost of the Baltic states, it's a pocket-sized republic that's a nature-lover's delight, yet lacks nothing in urban excitement. A tapestry of sea, lakes and woods, Latvia is best described as a vast unspoilt parkland with just one real city – its cosmopolitan capital, Riga. The country might be small, but the amount of personal space it provides is enormous. Estonia doesn’t have to struggle to find a point of difference: it’s completely unique. It shares a similar geography and history with Latvia and Lithuania, but culturally it’s distinct. Its closest ethnic and linguistic buddy is Finland, and although they may love to get naked together in the sauna. Vilnius, the baroque beauty of the Baltic, is a city of immense allure. It easily tops the country's best-attraction bill, drawing tourists like moths to a flame with an easy, confident charm and a warm, golden glow that makes you wish for long midsummer evenings every day of the year. The capital may be a long way north and east, but it’s quintessentially continental, with Europe’s largest baroque old town at its heart. Viewed from a hot air balloon, the skyline – pierced by countless Orthodox and Catholic church steeples – looks like a giant bed of nails. Adding to this heady mix is a combination of cobbled alleys, crumbling corners, majestic hilltop views, breakaway states and traditional artists’ workshops – all in a city so small you’d sometimes think it was a village. 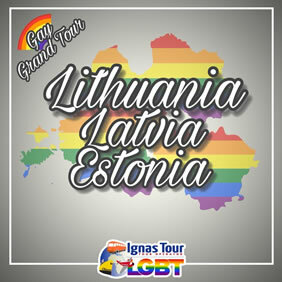 • Buffet Breakfast and enjoy a special LGBT Friendly Tour of Vilnius. • Start this special LGBT Friendly walking tour of Vilnius from the Gates of Dawn and one of the most visited shrines in Vilnius that is famous not only in Lithuania but also abroad, worshipped by the representatives of other creeds too. • Continue to the church of St Anne, a masterpiece of the late Gothic period. St Anne’s Church, which has survived to the present day without changing for over 500 years, has become a symbol of Vilnius. • Then reach the self-proclaimed "Republic" of Uzupis, Vilnius' Bohemian and artistic district. It has its own anthem, constitution, president, bishop, two churches, the Bernadine Cemetery, seven bridges, and its own guardian called The Bronze Angel of Uzupis, who was put in the centre of the district in 2002. • Explore one of Vilnius' oldest districts and admire its worldwide famous constitution where it is written that "6. Everyone has the right to love" and "16. Everyone has the right to be happy", no matter how. • Afterwards observe the imposing Cathedral of St. Stanislav and St. Vladislav is the most important place of worship for Lithuania’s Catholics, and the venue for the country’s main Christian and national festivities. • Be ready to climb up to Vilnius Cathedral Bell Tower, one of the oldest and tallest towers of the Old Town, which offers a beautiful panorama. Take a look from afar to the Hill of Three Crosses. Some say, that the origins of the three crosses date back to the 17th century when three monks placed them there to pay tribute to a group of fellow monks who were martyred in the 14th century. According to the history books, seven monks were killed and seven were tied to wooden crosses and floated down the Neris River, with the instruction to return to the west where they came from. After the tour you can climb on your own the hill to reach the monument. • Free time in the afternoon, we suggest you to explore the famous Trakai Castle just outside Vilnius. • Enjoy the night in one of the many pubs and bars of the city. • Dinner on your own and overnight at your hotel in Vilnius. • Buffet breakfast and transfer from your hotel to the Bus Terminal Station. • Then take your Bus to your next Baltic destination: the exciting Riga! • Arrival in Riga, accommodation at your hotel. • In the late afternoon free time in Riga. • Overnight at your hotel in Riga. 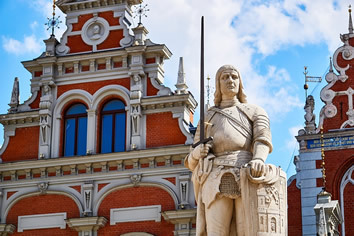 • Buffet Breakfast and enjoy a special LGBT Friendly Tour of Riga. 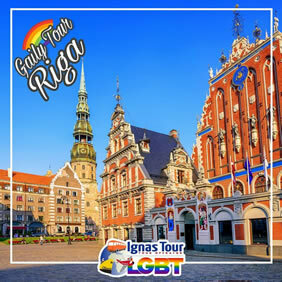 • Start your incredible LGBT Friendly walking tour of Riga from its amazing Cathedral with one of the biggest organs in Europe. • Proceed towards Riga Castle, which also houses the offices of the Latvian president. Admire St. James Church and the parliament. • Continue to the James' Barracks where you will find many trendy shops and cafés and remnants of the Old City Walls. Reach the red brick Powder Tower and the Museum of War next door. • Afterwards continue to the Freedom Monument on the edge of Old Riga and then proceed to Sky bar at Radisson Latvia Hotel where you can enjoy a breathtaking view of the city. • Dinner on your own and overnight at your hotel in Riga. • Buffet Breakfast and enjoy your excursion to the spectacular city of Jurmala. • You will admire stunning beaches as well as some amazing architecture and beautiful nature. • Admire the beautiful beach and walk the crowded pedestrian streets full with bars and cafes (and the odd oligarch). • You will also see the other side of Jurmala, quiet tree lined streets, 100 year old wooden mansions and soviet era eyesores and stunning nature reserves. • Free time in the afternoon and then back to Riga. • Then take your Bus to your next Baltic destination: the surprising Tallinn! • Arrival in Tallinn, accommodation at your hotel. • In the late afternoon free time in Tallinn. • Overnight at your hotel in Tallinn. 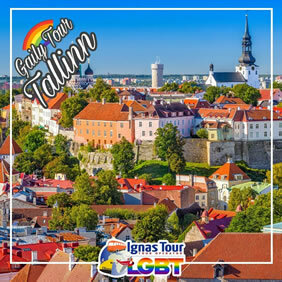 • Buffet Breakfast and be ready to discover together with our LGBT Friendly Tour Guide the special Old Town of Tallinn, one of Europe's best preserved medieval towns. • With plenty of narrow lanes and hidden courtyards, you will be soaked in a mix of medieval and modern sightseeings. • The city of Tallinn hides many historical secrets. One of these is the story of the local LGBT community. • The tour will introduce this story through local city streets and landmarks. Take a look to the City Hall Square, the churches of St. Nicholas and of the Holy Ghost, Catherine's Passage & Courtyard of the Masters. • Enjoy a special underground tour of Tallinn, the mysterious passages in the city's earthwork fortifications In the bastion passages, a train to the future takes you to the year 2219 and back to the 17th century. • After the incredible tour, reach Toompea Hill and Castle, Nevski Cathedral and enjoy a breathtaking view of Tallinn from one of the many observation decks. • Free time in the afternoon, we suggest you to explore the Kadriog Park and KUM, the new Estonian Art museum. • Dinner on your own and overnight at your hotel in Tallinn. • Breakfast in the hotel and transfer to the Tallinn airport. The 3-star Hotel Panorama is located in the Vilnius’ Old Town, 500 m from the Gate of Dawn. It offers rooms with free Wi-Fi, satellite TV and a bathroom with a hairdryer. All rooms at the Panorama Hotel are bright and decorated with warm colours and classic furniture. Each comes with work space, while most offer city views. The top floor of the hotel also features a lounge area, where guests can enjoy panoramic views of the city. A varied buffet breakfast is served every morning in the hotel’s spacious restaurant, which specialises in European dishes. Guests can enjoy a drink or a snack at the bar. The historic Gediminas Tower and Town Hall Square can be reached within a 15-minute walk. The bus and train stations are a 3-minute walk away from Hotel Panorama. Located in the heart of Riga, Ibis Riga Centre is set across the street of Riga Central railway station and 400 m from the Old Town of Riga and Latvian National Opera. Ibis Riga Centre welcomes it's guests in a restaurant and bar. Free WiFi is provided throughout the hotel. You will find a 24-hour front desk at the hotel and breakfast buffet is provided from 4 am to noon. Set in a historical building from 1895, modern rooms in Ibis Riga Centre offer contemporary design, blackout blinds and soundproofing. A flat-screen TV set is featured in every room. A private bathroom with a shower, toilet and toiletries is available for guests too. Riga Central Market is 500 m from Ibis Riga Centre, while Riga Dome Cathedral is 1 km from the hotel. The nearest airport is Riga International Airport, 9 km from the hotel. Located in Tallinn’s Old Town, Hotel Bern offers air-conditioned rooms with a flat-screen TV with satellite channels, a minibar and free Wi-Fi.It is only 100 m from the Viru shopping district. The rooms of the Hotel Bern feature a classic interior design, carpeted floors and wooden furniture, which includes a work desk. All rooms have private bathrooms equipped with hairdryer. Viru square is just 190 m away, and Raekoja Plats and the Town Hall are both within 500 m. The passenger port is 1.2 km from the Bern. There are many shops, restaurants and pubs in the area.